Hiring a coach can be amazing for your personal and business development. And there is certainly no shortage of coaches out there who can help you with just about anything you need help with. Need to reach the next level in your business but feeling stuck? Hire a mindset coach to break down the barriers of your stagnation. Never able to ask for the prices you want for the services you offer? Hire a financial coach to help get you un-stuck from a lifetime of money stories you’ve had chiseled into your brain. So, when I was relatively new in the business/freelancing world, I felt that I needed a business coach 1) because they seemed to be everywhere and in all the Facebook groups I was a part of and 2) I felt like I needed to go lightning-fast in order to bypass all of the average mistakes any just-starting-out-in-business individual would make. Well surprise, surprise! Hiring a business coach for these reasons only ended up being my biggest (and costliest) mistake of the year! Yay for expensive lessons. Long story short, I learned that there are good coaches and there are not-so-good coaches out there in the online world. And, while I’m sure this particular one was great for her particular ideal clients, the advice and guidance she offered wasn’t great for me. So after much soul-searching and only a couple of sessions, I knew I couldn’t stick it out and I’d have to jump ship. Lesson learned: never hire a business coach (or any coach for that matter) just because you feel that everyone else is doing it. Of course, I think coaches can be incredible when the time is right for you in your own personal journey, but it’s important that you know exactly what you’d also like to achieve from the experience. 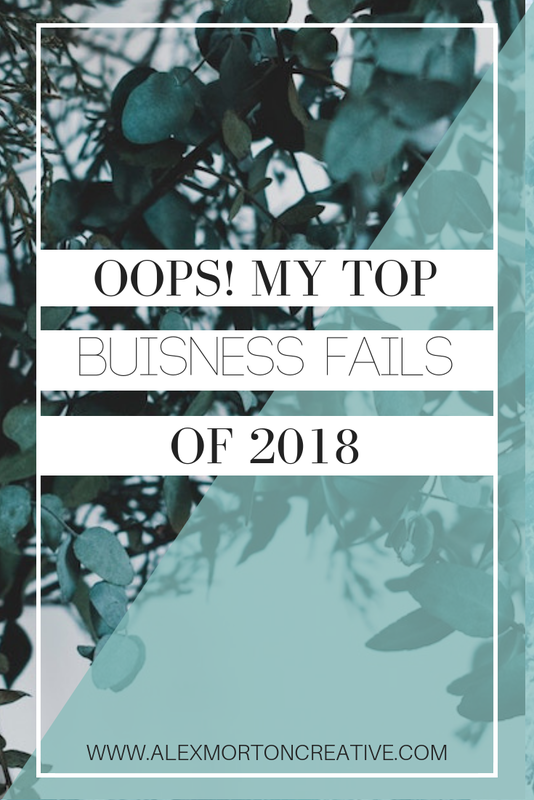 Fail Number Two comes from a bit of the same mentality as before of wanting to level up maybe a little bit too quickly and prematurely when starting out in business. Similarly to hiring a business coach, I felt that I needed to hire someone immediately for the little things that I didn’t feel so inclined to do (namely social media) within my business. And while a month of social media management was totally fine, I found that since I was still just starting out, I was also learning a lot of the major ropes when it came down to my own strategy. So, I could never really “let go” of the control since I didn’t have anything leading me in the direction I wanted to go in the first place. Lesson learned: Just as I should never hire a coach “just because,” I likewise shouldn’t try to expand my business into something it’s not and in such an early stage. It’s better to first nail down my strategy and get familiar with my own style in business and growing that business (and at whatever pace that may take) and then consider bringing someone on later down the line. Now, at the beginning of this year - when I was just starting out, I was hungry (starving!) to get experience with all different types of clients in order to build my web design portfolio. So much so, that when someone was passing along a client to another contractor (red flag number one? ), I jumped at the opportunity to help bring the client’s vision to life. Everything started out nicely enough and I was able to draft a design that we’d soon implement. The trouble started, though, when things got quite nit-picky and particular. Never mean, by any means, but I had a hunch that this was what it would be like to work with clients who are bent on negotiating the price of a web design as low as they could go but who then ended up never being satisfied with the end product. Lesson learned: I needed to stick with my prices and really know my ideal client and who I most enjoy working with. This will help avoid any confusion, miscommunication, and bitterness during what should be a smooth and wonderful design project! Welp, those are my top fails of 2018. All in the name of transparency, am I right? Here’s hoping 2019 brings on some interesting lessons to learn as we all grow in our own personal and business endeavors!